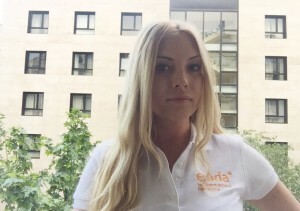 EADA’s multicultural environment has challenged me to expand my horizons, understand diverse cultures and cope with challenging tasks. Collaborating with different people on projects and presentations has improved my communication skills and helped me becoming comfortable speaking in public. I have learned to see any challenge as an opportunity and to be confident in my ability to reach my goals. I also learned the importance of taking the initiative and standing by my own opinions instead of conforming, and I can notice that these changes have improved relationships with my classmates, friends and family. The modules in EADA’s Collbató Residential Training Campus form part of the Professional Development Programme (PDP) that helped me grow both personally and professionally. The modules focus on developing soft skills through constantly challenging us to reconsider the way we think about and analyse problems. It puts students in real-life situations to help them build the skills to succeed in the business world: effective communication, analytical problem-solving and emotional intelligence. It helped me identify my weaknesses and develop a plan for improving my competences. In the Negotiation module, I improved my problem-solving skills and ability to analyse a problem to determine the interests of other parties. As an effective negotiator, I am a better team player and am able to act decisively in everyday life. Through this module, I learned the importance of preparation, defining goals and the importance of active listening in reaching an agreement. Along with negotiation, leadership is a common topic of conversation in the business world, but I did not fully understand it until I had completed the PDP modules. The final leadership module taught me how to identify and efficiently apply my personal leadership style, which was of great important in guiding my team. Analysing the world’s greatest leaders, this module made me realise the importance of dedication and creativity for success. This module taught me that true leaders are not born but made, and that with hard work and a firm belief in my abilities, I can achieve greatness. An optimistic way of thinking and clearly defined objectives will be key to building on my leadership style and leading my team. Milica Drecun is from Serbia and completed her undergraduate degree in Business Studies at Cardiff Metropolitan University, London School of Commerce. Milica is currently doing an internship at the Ministry of Foreign Affairs in Belgrade.